WHY WE LOVE IT: We love giving readers smart and thrilling science fiction books, such as The Hypernaturals, Six-Gun Gorilla, and our adaptation of Philip K. Dicks Do Androids Dream of Electric Sleep?. We continue that tradition with Eternal, a story where humans can continually make clones of themselves, so death is a thing of the past. We need to know: What does a world like that look like?<br />WHY YOU'LL LOVE IT: William Harms (Impaler, Infamous) is crafting a gripping, sophisticated story about what happens if science completely changes the rules of life itself. This is a story where characters ethics and loyalties are tested, for society has changed but human failings remain the same. 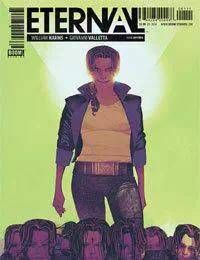 The next step in humanity is brought to glorious life by Giovanni Valetta (Dark Horse Presents).<br />WHAT IT'S ABOUT: In a world of clones, the Human Liberation Army wants to free people from New Lifes grasp. Their leader Gail will take the most drastic, personal measures yet to do so. Rathmann, a former homicide detective turned New Life enforcer, is on the case, and is asking tough questions. Violet, a young girl and one of the few non-cloned humans—or Pures—left, is longing to enter the real world. But she has no idea the danger she is stepping into.